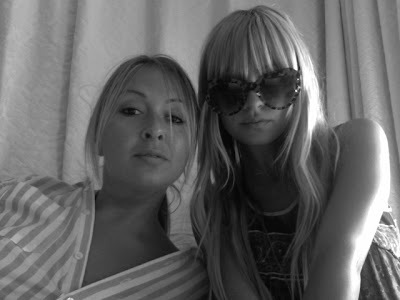 NICOLE RICHIE NEWS: Nicole & Masha Twitpic !! Nicole & Masha Twitpic !! Nicole Richie recently posted this lovely picture of herself and friend Masha Gordon on Twitter .. "Suprise of the day by @missmashagordon." Such a lovely picture! And i love Nicole's bangs on this picture they look perfect, if only mine always looked like this! Masha is definetly one of my favourite friends of Nicole, she is a great person and really nice. I think Nicole and Masha should make their own TV series .. Simple Life inspired..maybe? I totally love this picture!! I love black & white pics in general and I agree with you, her hair look perfect!